MIDDLETOWN, Calif. (AP) — Authorities say two more bodies have been found in homes burned by a California wildfire, bringing the death toll from the blazes in the northern part of the state to five. The Lake County Sheriff’s office says official identifications have yet to be made, but they are presumed to be the bodies of Bruce Beven Burns and former San Jose Mercury News police reporter, Leonard Neft, 69. Burns age was not released. Neft last spoke with his family Saturday evening. Authorities earlier found his burned-out car on the route he would have used to escape. His daughter Joselyn Neft said his wife, Adela Neft, repeatedly called him Saturday to tell him to leave the house, but he told her he didn’t think the fire was coming toward him. Neither woman was immediately available Thursday. His house was in the same area where Barbara McWilliams, 72, was found dead. She told her caretaker she didn’t want to leave her home near Middletown and would be fine. Cadaver dogs found the bodies in the Hidden Valley area and the Anderson Springs area Tuesday night, Brooks said. Two more people remain missing. KRON reports a man named Edwin Null is one of the missing. The name of the other person was not released. About 170 miles southeast, in a separate wildfire in the Sierra Nevada foothills, two bodies were found inside burned-out homes, Calaveras County coroner Kevin Raggio said. One of the victims was identified as Mark McCloud, 65, who was found inside his residence Tuesday in the Mountain Ranch area. Raggio wouldn’t release the name of the second victim, also found inside a home in Mountain Ranch, because the family has not been notified. The tragedy comes as firefighters gained ground on the massive blazes thanks to cooler weather and some rain on Wednesday. The fire in Lake County has charred 115 square miles and was 35 percent contained Thursday. An estimated 585 homes and hundreds of other structures have burned. The fire in Amador and Calaveras counties has burned 110 square miles. It was 49 percent contained Thursday after destroying 252 homes. Bender reported from San Francisco. 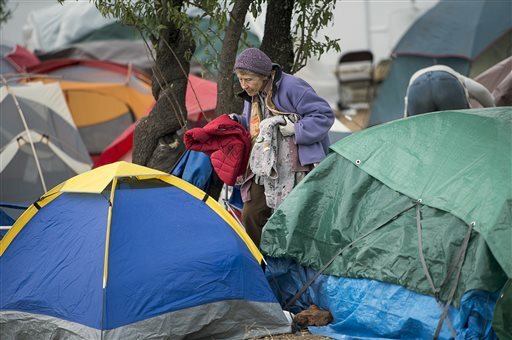 Associated Press reporters Paul Elias and Olga R. Rodriguez in San Francisco, and Janie Har and Haven Daley in Middletown contributed to this report.